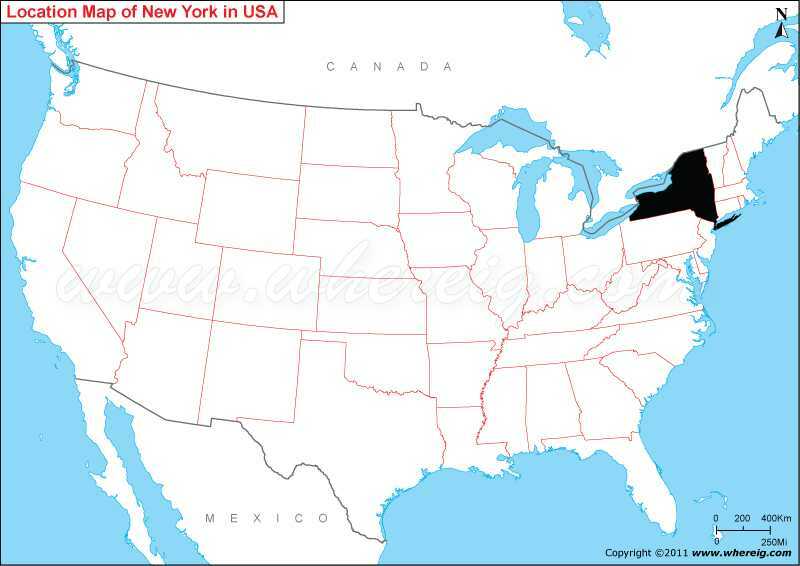 Map showing location of New York on the US map. As shown in the given New York location map that New York is located in the north-east part of the United States. New York map also shows that it shares its boundary with Vermont in the east, Massachusetts and Connecticut in the south-east and New Jersey and Pennsylvania in the south. Besides, New York has also the maritime border with Rhode Island and international border with Canada. The climate type of New York is humid continental climate. In fact, New York is more often written and spoken as New York State in order to distinguish it between the New York State and New York City. Both the names i.e. city name and state name had been named for the 17th century Duke of York, James Stuart, future James II and VII of England and Scotland. The capital city of state is Albany; however, the largest city of the state is New York City. Other important cities are: Buffalo, Rochester, Yonkers, and Syracuse. Interestingly, New York is recognized as the financial, cultural, transportation, and manufacturing center of the US. Furthermore, it is one of the states of the US that is visited by maximum foreigners. The economy of the state depends upon agriculture, manufacturing, finance, and other industries. Important industries are printing and publishing, scientific instruments, electric equipment, chemical products, machinery, and tourism. And, the agriculture products are dairy products, cattle and other livestock, vegetables, nursery stock, and fruits.